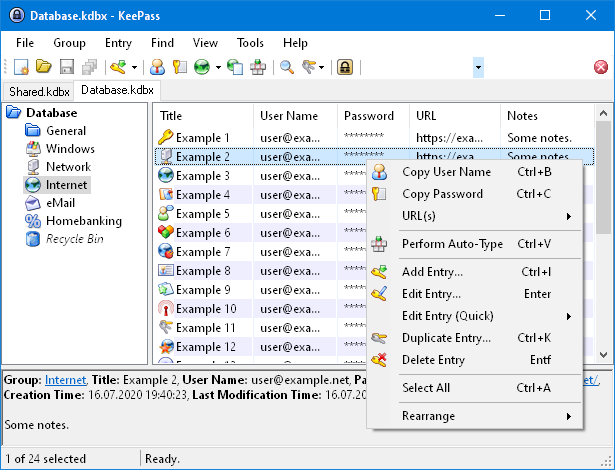 KeePass 2.39.1 has been released today! You can get it here: Download KeePass 2.39.1. This is a stable release. It is recommended to upgrade from any previous 2.x version to 2.39.1. 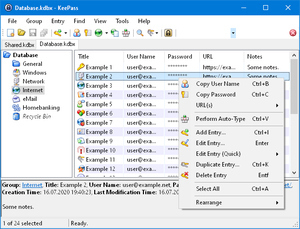 KeePass 2.39 (2.39.1) mainly features user interface and integration enhancements, and various other minor new features and improvements. Hashes and signatures for integrity checking are available, and program binaries are digitally signed (Authenticode). New translations are available, too. For a comparison of the current KeePass 1.35 and 2.39.1, see: Editions Comparison. If you like KeePass, please don't forget to donate. KeePass now uses Transactional NTFS (TxF) for writing database and configuration files, if possible; this improves the compatibility with other programs that are watching these files (e.g. file synchronization services). Added command 'Edit' → 'Show Entries' → 'Large Entries'. Added command 'Edit' → 'Show Entries' → 'Last Modified Entries'. Added option 'Automatically save after modifying an entry using the entry editing dialog' (turned off by default). Added option 'Minimize main window after performing auto-type' (turned off by default). Added option 'Show lines between nodes in tree views' (turned off by default). Added support for importing Google Chrome 66 password CSV files. Added trigger event 'Time - Periodic', which is raised at user-defined intervals. Links in the entry string editing dialog are clickable now. Added UIFlags bit for disabling the 'XML Replace' menu item. Added UIFlags bit for hiding auto-type obfuscation compatibility information dialogs. Added workaround for .NET 'urtf' RTF round-trip bug. Secure edit controls are now extensible by plugins. KPScript: the 'AddEntry' command now supports the '-setx-Expires' and '-setx-ExpiryTime' parameters. In printouts and HTML exports, expired entries now have a red 'X' icon (if the option 'Icon' is turned on). Improved string normalization in the entry and string editing dialogs. Improved and optimized process memory protection, especially in the entry editing dialog. Improved behavior when moving a custom string to a standard field. URL overrides are now used also for application URLs. When trying to toggle the auto-start option and creating/deleting the registry value fails, KeePass now shows a detailed error message. Stream disposal improvements in exceptional situations. Extended inter-process communication (IPC) messages are compressed and encrypted now. New IPC mechanism on Unix-like systems. Enhanced desktop type detection on Unix-like systems. On the Cinnamon desktop, the 'Always on Top' option is now disabled (because it is not supported properly by the environment). KeePass now ignores hidden Git and Visual Studio directories when building a PLGX file. The trigger system now ignores state-changing placeholders in most places. Removed trigger event 'User interface state updated' (consider using the new event 'Time - Periodic' instead). The 'View' button on the 'History' tab of the entry editing dialog is now disabled when multiple items are selected. The main window state is now updated after closing an entry report dialog. File transactions: improved access control list (ACL) restoration. The option to minimize the main window after performing auto-type is now ignored while displaying a subdialog. Plugins can now implement classes derived from KeePass' custom rich text boxes.